It’s week 5 of the Big Sky Conference football season and I decided I wanted to do some predictions instead of recaps.. and I really missed typing in Microsoft Word. There’s one terrific matchup in the Big Sky this week between Eastern Washington and Sam Houston State. If the chips fall right this could be a national championship matchup. The week starts off with Cal Poly headed up north to take on Portland State. Neither of these teams have shown us too much yet. Both have FBS losses, both have an FCS win. Portland State has a good record, but they’ve had a healthy dose of cupcake. This will be a nice test for both teams and a gauge to see where they’re at. Portland State quarterback Keiran McDonagh has had a nice season so far and should keep the Cal Poly defense off balance. I like Portland State in this one, maybe by a touchdown or so. These guess are completely off the top of my head and not in any way scientific. I can’t even say I did a random Twitter poll to get these picks. I’m legit though. 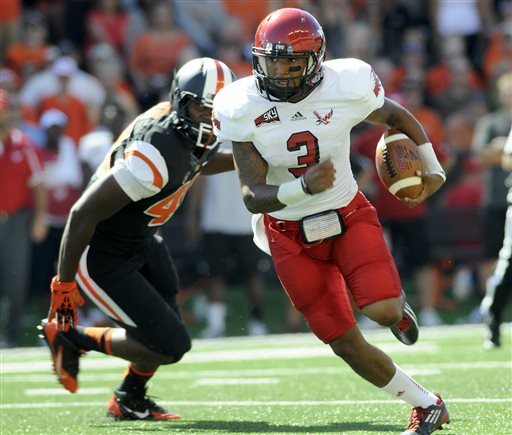 Eastern Washington makes a road trip to Huntsville Texas to take on Sam Houston State. This game is most likely one of the better FCS matchups we’ll see this year. Both teams are ranked very highly and this game has the potential to blow up the scoreboard. I have a hard time seeing this game finish under 80 combined points. Leave the defenses at home, kids. I think Sam Houston takes this one.. they may not be more talented than Eastern, but they’re playing at home. Big day for Richard Sincere. Bearkats by three. Montana State heads to Grand Forks for a game with the North Dakota [insert nickname here]. The Cats are recovering from a loss to Stephen F Austin, and before that SMU. This will be the third long road trip for the Cats this season and the competition doesn’t get much easier, especially without your starting quarterback, Denarius McGhee. The Cats offense isn’t the same. North Dakota, on the other hand, still likes to throw the football. I gotta give this one to North Dakota.. the Cats are struggling, they’re on the road, this just isn’t their game. They lose by 6. Southern Utah heads to Northern Colorado. Poor Northern Colorado. Another year, another loss to a division 2 team. Couple that with a loss to Wyoming, loss to Northern Iowa and there’s not much excitement in Greeley these days. Southern Utah comes in with their only loss to Washington State. They also own an FBS win and a win over Sacramento State. The Thunderbirds are a good team, the Bears are possibly without starting quarterback Seth Lobato.. easy pick here. T-Birds by 14. Sacramento State visits Weber State this weekend. I wish I could say this was going to be the pillowfight of the week, but it’s not. Just wait. Sacramento State, if you’ve read my blogs, have been abused by yours truly. So has Weber State, possibly the worst team in the Big Sky. Weber has given up a horrific amount of points. Sacramento State nearly got housed by a NAIA school. What’s going to give here? If I had a guess I’d say Weber’s defense to the tune of 45 points. Was that mean? Idaho State and UC Davis (no dash), welcome to the Big Sky pillow fight of the week. My buddy Mike might award both of these teams his famous “Oh No Romo” award. Idaho State has two wins on the season.. but don’t let that fool you, it was against two really awful D2 teams, couple that with an embarrassing loss to Washington and we’ve got a cocktail for disaster since UC Davis has yet to notch the W column of the Sunday paper. Honestly.. this could end in a tie at zero zero. UC Davis has produced nearly zero offense this season, Idaho State still throws the football. Oh god, I just noticed Davis and Weber play this year. Anyways, Idaho State wins this, probably by a safety late in the 4th quarter. I actually had to turn on LMFAO on YouTube to get through that last game. Seriously. In the Big Sky nightcap Montana heads south to Flagstaff to take on Northern Arizona. Montana is absolutely rolling this year so far. Dominating wins over Appalachian State, North Dakota, and some scrub and they’re sitting at 3-0. Northern Arizona has a pair of FCS wins and a loss to Arizona. NAU still has Zach Bauman. I don’t think NAU has the gas in the tank to keep up with the Griz offense in this one. Jordan Johnson is moving the football VERY efficiently so far. Games in Flagstaff are typically pretty close between these two, but I think the Griz take this one by 20, even with a big night from Bauman.